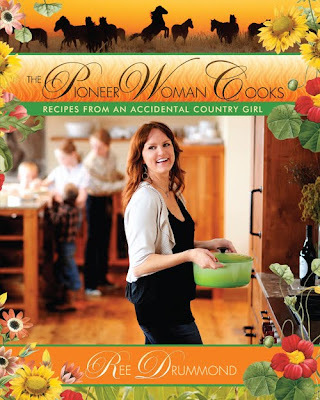 If you haven't heard of The Pioneer Woman, well you've been living under a rock! Ok, I'll cut you some slack but you have to promise me you'll check out her website. She grew up in Bartlesville, OK (I lived there! ), went to USC for college, came back home briefly before she was headed to Chicago (which didn't end up happening), met her future husband and got married. Turns out her husband is a very wealthy rancher that owns the most land in Oklahoma. Her blogs, "confessions", is about her daily journey as a rancher's wife and her crossover from city life to farm life. She is also an outstanding photographer, homeschooler to her four children and an unbelievable cook! Ree (her real name) is so good that she even made her own cookbook with her favorite recipes. I believe since it's been released, the book is on the top sellers list. It has all kinds of easy recipes that Ree has photographed every step of the process so you know what it should look like. Brilliant! Click here is learn more about it on Amazon. All that to say is that Ree went on a book tour when it launched, AND she came to Houston last weekend! You better believe I was there! I had been reading on her blog that large crowds were coming out to see her at the other stops around the country so I knew that I had to be prepared. One of my best friends, Katie, is also a Pioneer Woman follower and was just as thrilled as I was to meet Ree. I called head to get the book signing tickets and bought a few books. We even got there two hours before the signing to get seats. There were tons of people standing and it was even held at a huge local healthy grocery store, Georgia’s Market. When Ree finally came out the crowd went wild. :) She is even more gorgeous in person! She always talks about being nervous in front of people and you could kind of tell but she pulled it off. They did a little question and answer portion for about 20 minutes which was fun. Then the signing was after that. I would say the actual signing started at 1:30, and they told people that got there last that they should expect to be there until 6:00pm!! Luckily, I had called in advance and reserved some pretty decent spots in line. They went by color groups and we were the forth. So we did have to pass a little bit of time before our color was called. Katie and I found this really unique chair and had to try it out. Tons of people waiting in line or waiting for their color to be called. Katie was excited that our color was about to be called in this pic. You can see Ree in the background because we were trying to get close to spy! It finally was our turn to meet her. We even had an in because both of us had lived in Bartlesville and new people that Ree grew up with! She was such a pleasure to meet. Super sweet! We each had to take a picture with her. The second best thing about the book signing (after meeting PW) was that Ree was giving out free t-shirts made by Wild Olive, who I LOVE! The tees are amazing and I wore mine the very next day. SO JEALOUS. My mom waited a long time to get mine signed. And now my mom is a fan too! She made the lasagna last week, and it was a big hit! I'm sad because PW is not coming anywhere near VA. SO JEALOUS!!!! Are one of those cookbooks for me?! :) SO glad you got to go! That is awesome! I love reading Pioneer Woman and trying out some of her recipes. Good pictures of all of you! I didn't know she was coming to Houston. I was going to say at first that I wished I would have known and I would have gone, but now reading through your whole post and seeing the massive lines I will just be content with reading her on the internet! i guess i need to check out her book!! Awesome! I love PW too. This is amazing! Great pictures!! Oh Man! I wish I would have gone too.... I love PW. I hope and aspire to be like her. But, who am I kidding?! Have a good weekend! Love PW! And love your blog! Fun times! Hello to another Houston blogger! I was there also, and never sat in that weird chair, though I wanted to. Nice to meet another houston blogger. Cute pictures-and cute outfit! That was the best day EVER. I smiled all weekend. I even wore my shirt over my sweater when I left. I'm thinking of framing it and hanging the shirt on the wall. Looks like a ton of fun! I found your blog via PW and love the banner and design. So cute! I especially love your heart for Jesus and the verse in your banner. I'll definitely be back! Wow, what a fun time. I have gotten a few recipes off of her site and have never been disappointed. I wonder if KC is on her schedule?? As far as my car goes, nothing. She plead guilty and my insurance company will be suing her boyfriend (who actually owned the vehicle) and see if they can't get any of my loss back out of it. Good luck, right? I guess it was a good thing that at least I had insurance. System doesn't make any sense to me. I love your blog its so cute! my friend and I where there for PW's book signing too and also sat in the crazy chair! I think it was screaming our names! lol. 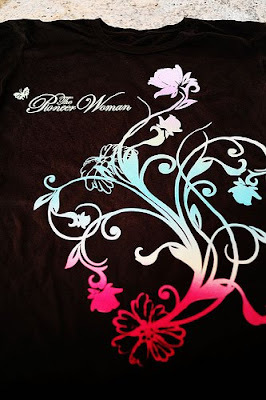 Where did you get your design for your blog, I love it.